My parents took Daisy overnight for us so we could enjoy a late night out with friends, so I wanted to cook them a nice breakfast when they brought her back this morning. 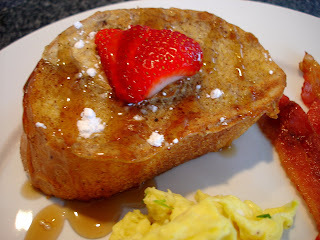 I decided to do a stuffed French toast and browsed some recipes for ideas on what to use for the "stuffed" part. This recipe looked really good, so I changed some things, took some things out, and added some things to make it my own. Heat a bit of olive oil and butter in large nonstick pan or griddle; I like to use a large griddle that covers 2 burners. Additionally, preheat oven to 300 degrees. Slice bread into slices about 1 1/2 inches thick, not using the ends (I got 6 slices out of a regular loaf of French bread). Then slice 3/4 of the way through each slice, just about in the middle, making a slit for the stuffing. 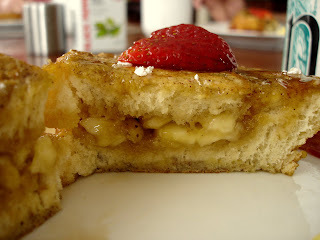 Take a spoonful of the banana mixture and put it into the slit of each piece of bread. Make sure the bread closes around the stuffing. Dip stuffed bread in the egg mixture being sure to coat both sides and edges completely. Let the bread sit in egg mixture just a touch longer than you would with a thinner bread; you want to make sure the egg soaks more than just the surface of the bread. Put the bread onto the griddle and cook on each side for about 3 minutes, until golden brown. Transfer bread to a cookie sheet and bake in the oven for about 5 minutes to cook the bread all the way through. To serve, I sprinkled a bit of powdered sugar onto each piece of toast and also garnished with a strawberry that I cut into a fan. WOW!!! YUM! Just a touch of maple syrup made it complete. The bread was sweet and crunchy, and the stuffed center was a gooey, tasty surprise. 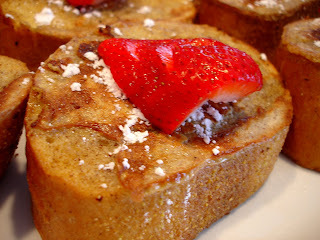 I can imagine making this toast with all sorts of fillings - apple, strawberries or a mixture of berries, pears, or mango and papaya for a Caribbean flair. Wow! That looks incredible! I may have to make that next time my in-laws come up and sleep over.